download vCard Jeff is a founding partner of SE Capital, and has worked in investment banking, business consulting, and operations management with a wide range of companies since 1985. He spends most of his time working with portfolio companies to design and implement operating strategies and to improve overall business performance. 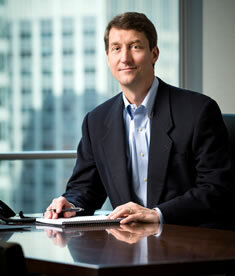 He also works to develop new investment ideas and shares administrative and operating responsibilities for SE Capital. In connection with SE Capital’s investments in Capita, Perceptis and Origin Healthcare Solutions, Jeff assumed the role of President and CEO. He managed each of these businesses through strategic build-up efforts and oversaw the successful exit of each investment. He currently serves as the Chairman and CEO of Claims Management Holdings, LLC. Previously, he was a Vice President at Goldman Sachs, L.P. in the Investment Banking Group. Earlier in his career, he was Vice President & General Manager of the financial services division at MCI Systemhouse Inc. and Associate Director of information technology at Swiss Bank Corporation. He started his career as a management consultant with Deloitte & Touche. Jeff has held seats on a variety of corporate boards, including Capita Technologies, LLC, Perceptis, LP, Convergis, LLC , SSIMed Holdings, LLC and Origin Healthcare Solutions, LLC. Jeff received a Master's in Mathematics from Northwestern University and a BA from St. Olaf College.